Every day there seems to be a new bar opening in Williamsburg, the hipster headquarters of Brooklyn. Thankfully, a new program not only curates some of the finest bars the area has to offer, it’ll make drinking at them a bargain. Created by professional boozehounds Casey Berry of Imbibe Denver and PJ Hoberman of Denver off the Wagon, the Brooklyn Passport is a spin-off of the successful Denver Passport. For $20, thirsty adventurers can obtain a pocket-size booklet of two-for-one drink specials throughout Brooklyn. 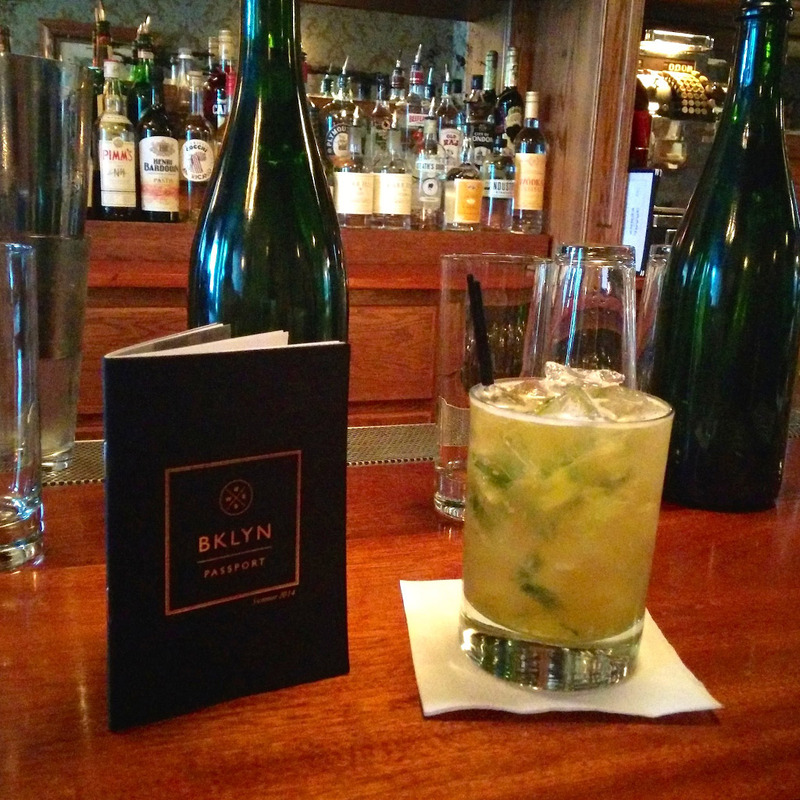 Redeem each special, and a bartender will imprint his or her bar’s page with an official BKLYN PASSPORT stamp, giving you a feeling similar to that of clearing customs in a new, exotic country. But instead of the typical dehydration brought on by a transcontinental flight, you’ll feel the more pleasant dehydration that follows a delicious cocktail. 1. Cubana Social, 2:05 p.m.
We started the day at a sweet little spot that nods to 1940s Havana, where a well-skilled bartender served us Rum Summers. Using double shakers, she blended and poured lemonade, rum, mint and ice into tall glasses for a refreshing, light (though perhaps a bit sweet) beverage available only to Passport holders. Crawl-mate and fellow writer Mike Pomranz called it a “low-impact mojito,” which I felt fit the drink quite nicely. It certainly hit the spot on this hot summer day, but by 2:30 we were ready to settle up and head for our next destination. Fabrica functions as an Italian trattoria despite its industrial coffeehouse vibe. “It’s Brooklyn chic meets Chili’s,” observed Jon Pack, another crawler attempting to categorize the place. You can question their aesthetics, but not their drinks. The Old Fashionista, a modern take on an old-fashioned composed of Michter’s Sour, brown sugar, orange bitters and Amaro Montenegro, was an early afternoon highlight. 3. Cantina Royal, 3:23 p.m.
Bartender Pedro was wrapping up a late lunch when we arrived at an empty Cantina Royal, but was excited to serve a fresh batch of afternoon patrons. He treated us to his latest invention made with jalapeño-infused Centenario, yellow Chartreuse, lime juice, tonic and a dried jalapeño that gave it an extra kick. The sinister yellow-green drink was so new that it had yet to be named, so Steve, another crawl-mate, suggested he incorporate the word celoso (jealous) for its unique hue. Pedro lit up and said, “Amor Celoso: jealous love!” We came. We drank. We baptized a new cocktail. 4. Grand Ferry, 6:05 p.m.
After a quick break to refuel with some chicken wings, we picked things up again at a retro 1920s speakeasy. Perusing the cocktail menu, I was tempted by the Captain Badass, a concoction of lemon juice, Amaro Abano, apricot liqueur, orange bitters and reposado tequila, solely for its name, until my stomach gurgled a reminder that I’d already had my fair share of agave alcohol for the day. While the rest of the crew ordered daiquiris, I had my sights on the Scottish Dew, made with cucumber, sugar, maraschino liqueur, orange bitters and five-year blended Scotch whisky. Despite its sultry, smoky character, the drink was still a refresher, thanks to the fresh cucumber. Papa’s got a new after-work go-to! Despite my stomach’s protestations, it didn’t take me long to get back on the tequila bandwagon. Desnuda’s signature peach-jalapeño margarita, called The Other Woman, features reposado tequila, Rothman & Winter Orchard Peach liqueur, habanero pepper and hibiscus salt, and it’s made me seriously consider investing in a South American peach and pepper farm. Desnuda’s comfortable back room, which includes a second bar, was perfect for our group, as it seemed to be growing at every stop. If you make it over there on your own crawl, stick around after your Passport is stamped for an extra full-priced cocktail in order to enjoy $1 oysters that are the perfect briny complement to any sweet drink. 6. Passenger Bar, 7:35 p.m.
My friend Dara immediately noted that Passenger Bar’s gilded mirrors and ornamental vaulted ceiling gave it the look of a faux “boutique German beer hall.” The half-off specials at this inviting bar included all house cocktails and draft beers, but by this point we were all beyond-thankful for the option of a sub-8 percent ABV beverage. While most people chose the Sixpoint Bengali Tiger IPA, I ordered a Captain Lawrence Kölsch before joining my friends at the pool table. Our hand-stick coordination was a little hampered but apparently our drinking skills were anything but impaired as we headed to our final stop. 7. St. Mazie, 9:05 p.m.
Perhaps we can credit our overflowing adoration to our inebriation, but St. Mazie proved to be one of our favorite spots of the day, with a beautiful outdoor garden and killer nightly live music. In New York, a stellar $10 cocktail is nearly impossible to come by, but Mazie offers one such option. I’d gladly return for their Hemingway daiquiri, even at that full price. Our crawl coming to a…crawl, we enjoyed one last nightcap: a bourbon and grapefruit mixture called the Midnight Cable, which, like the daiquiri, was a straightforward celebration of simple ingredients. We called in an order for a mezze plate of pickles, vegetable puree and focaccia at 10:15 p.m., and by 11, we were on our way back to the Bedford L train waving the proverbial white flag, conceding to a day that had been an exhausting success. The Brooklyn Passport program runs through Labor Day—September 1. Pick up yours now at bklynpassport.com!